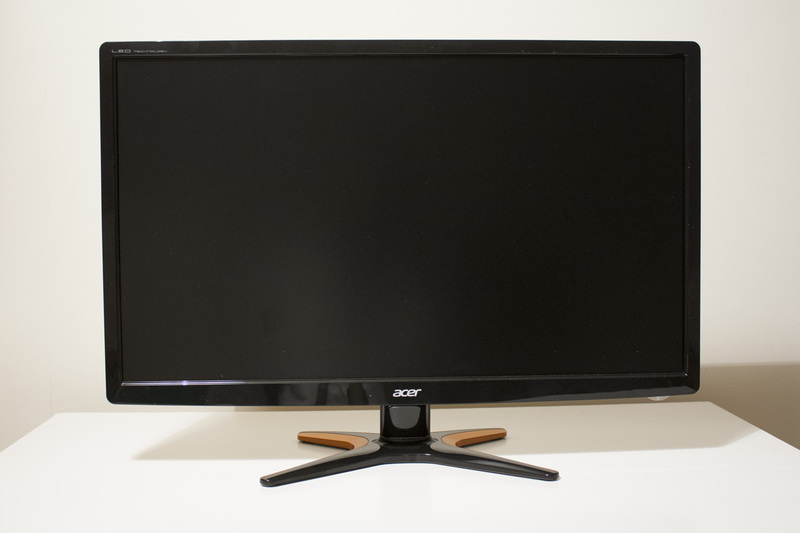 Today we’re taking a look at Acer’s gaming monitor, the GN. This is the 24-inch model, which boasts a fast 144Hz refresh rate that far surpasses the 60Hz standard. If your PC is capable of producing that many frames per second, you’ll see a much smoother experience. The other key specification is £190 – an aggressive price point for a 144Hz monitor. Let’s take a more in-depth look at the monitor’s specifications and physical features, before we move onto testing. The GN is a fairly standard looking monitor, with slightly rounded corners, an Acer logo below the display and a blue backlit power button at the lower right. The legs of the stand are fairly interesting looking, forming an X shape with a copper-coloured inner trim. On the back of the monitor, we have a large-ish Acer logo clearly intended to be spotted on esports broadcasts. Below this we have the 100 x 100 VESA mount. The thicker lower portion of the monitor houses all of the exciting bits, including a screw that secures the stand and the various ports on offer. We have, from left to right: an HDMI port, a DVI port and a VGA port. There’s also a 3.5mm jack for audio output when an HDMI audio input is used. The on-screen display is controlled with fairly standard downward-facing buttons on the lower right of the screen (which are of course rather infuriating to use). Initially you get access to the eco setting, an automatic mode, the main menu, the volume and the input. Inside the main menu, you get the standard array of options, including this useful screen that can tell you if your game is running at 144Hz or not. The Acer GN is designed to be a gaming monitor, so that’s where I’ll start testing it. I set the refresh rate to 144Hz and booted up Counter-Strike: Global Offensive. CS is a tough game that demands pinpoint accuracy and instant reactions, so any advantage I can glean from a faster refresh rate is important. I needed to turn down my settings a bit to get a steady 144 fps at 1080p, but it was totally worth it. The action unfolding on-screen felt a lot easier to comprehend, and my actions felt more natural and immediate. It’s hard to know how much of this was a placebo effect and how much was down to the monitor, but I turned in some of the best competitive matches I’ve ever played. I even went online with a Counter-Strike pro, and managed to out-score them in a frantic deathmatch game. It’s hardly a championship title, but I was happy enough with the result. Other games seem to benefit from 144Hz too. StarCraft II felt a lot more responsive than it did before, and even Borderlands: The Pre-Sequel felt more alive. The only stumbling block came when I tried Dragon Age: Inquisition. The game looked great, but even turning down the settings significantly I couldn’t get it running at 144 fps to take advantage of the monitor! Of course, by moving to a TN panel at 144Hz like the Acer GN, you’re sacrificing the image quality that you might have gotten from a similarly priced IPS, VA or PLS panel. If you’re coming from a 1440p resolution, you’ll notice the step down to 1080p too. Neither were dealbreakers by any means, but there are definitely arguments to be made for gaming at a higher resolution or on a prettier screen. Still – if you have a PC that’s capable of running the games you play at a steady 144 frames per second, then you should notice a big difference when playing at the higher frame rate on the Acer GN. While faster-paced games seem to benefit more than slower ones, I do feel I got a bit of an edge across the board, and that’s got to be worth the price of entry. I tried using the GN for writing articles and Photoshop, but I wasn’t impressed with the results. Images looked a little washed out if I was looking anywhere other than dead-on, and the limited resolution of 1080p paled compared to the 1440p monitor I had to the side. While the monitor was serviceable for day-to-day tasks (and it still felt awesome seeing a mouse cursor move around at 144Hz), there are better monitors for the money if gaming isn’t your focus. For these benchmarks, we’ll continue to use the Spyder4Elite calibration tool. Due to the TN panel, we expect to see worse results here than a VA or IPS panel, in areas like gamut, contrast and accuracy. 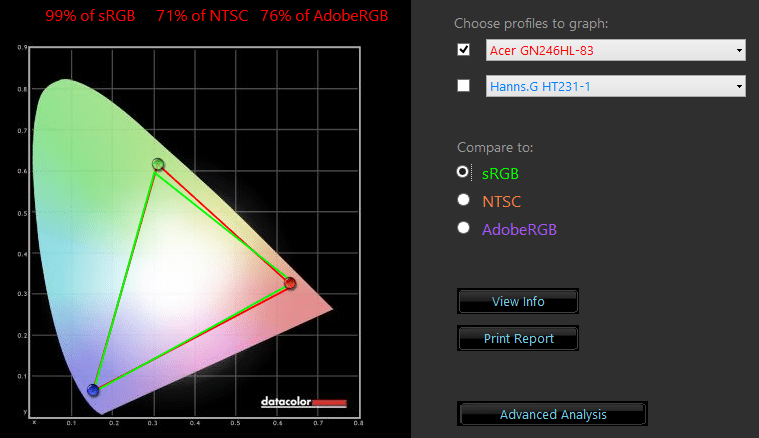 The first thing we see is that we’re at 99% of sRGB, 71% of NTSC and 76% of AdobeRGB. This isn’t a great initial result, although it’s typical for TN panels. This indicates we probably don’t want to do much colour-dependent work on the monitor. Next we examine brightness and contrast at various brightness settings. We see that we reach the 350 cd/m² level claimed in the specifications somewhere between 75 and 100% – although you’d normally never want to run a monitor at that high a level. Contrast ratios are decent, at around 550:1 on average. Colour uniformity is quite good for the monitor, with quite low results at all apart from the highest brightness setting. 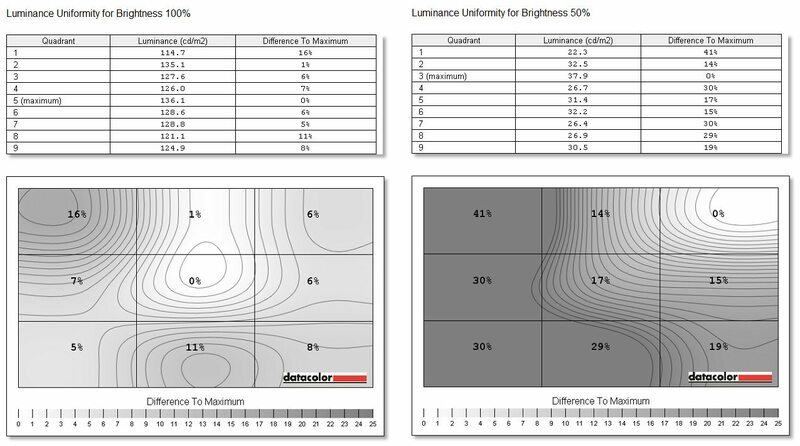 Luminance uniformity is quite poor though, with a massive 41% difference in luminance at the lowest brightness setting. This makes certain parts of the screen much dimmer than others, with most of the right hand side of the screen being much darker than the remainder. 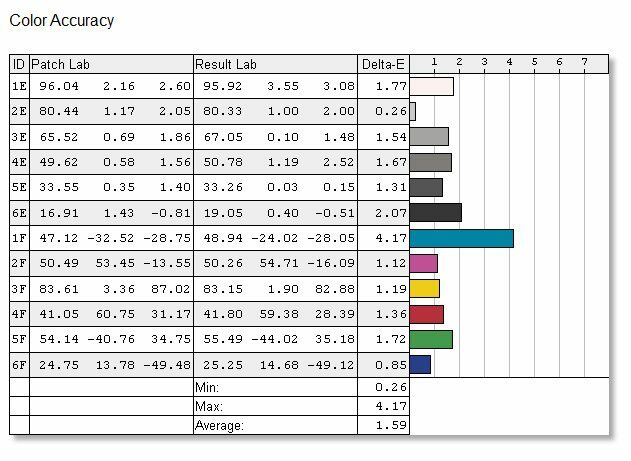 Colour accuracy is quite good for a TN panel, with a 1.59 average – one of the best scores here that we’ve seen, in fact. 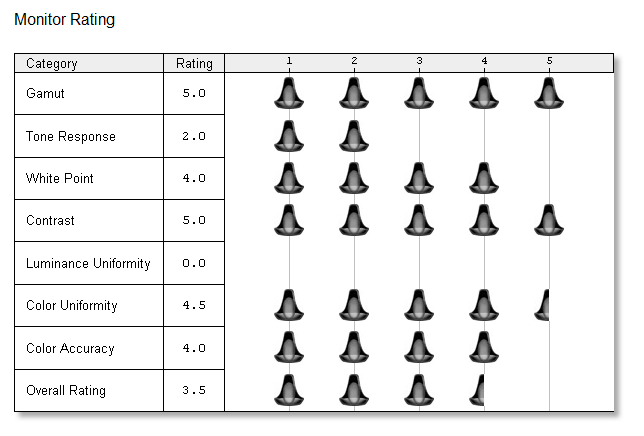 Just for good measure, we’ll include the tool’s own monitor rating tool, which gives the Acer monitor high marks in almost everything except luminance uniformity, which it gives an unprecedented 0/5 stars. Brutal. The Acer GN246 is an excellent gaming monitor for the money, offering that desirable 144Hz refresh rate that’s ideal for high frame rate gaming and 3D. While its viewing angles and OSD are fairly mediocre, there are no real deal-breakers here. If you’d rather have a smoother, more responsive monitor than a higher resolution one, then the Acer GN246 seems like a great monitor to look at first. Competitive price point – perhaps the cheapest 144Hz monitor?